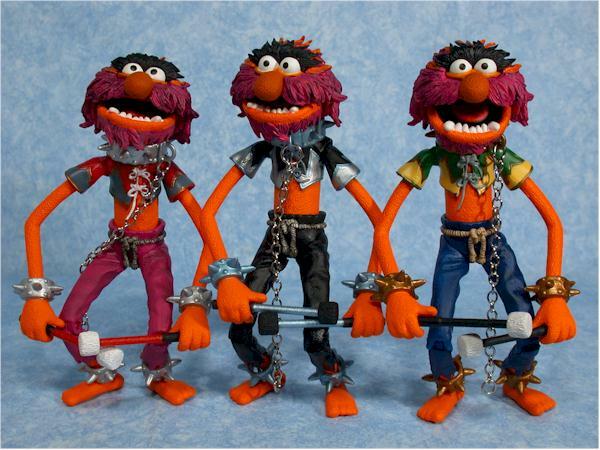 One of everyone's favorite Muppets is Animal. He represents the crazy wild man in all of us, free to do what he wants, unfettered by society or hygiene. 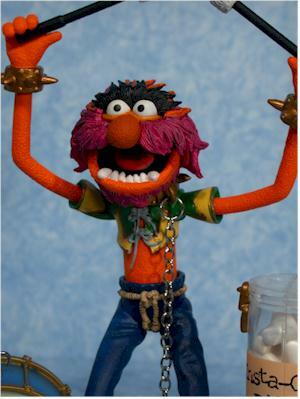 Then it's no wonder that one of the favorite Muppet figures from Palisades has been Animal. 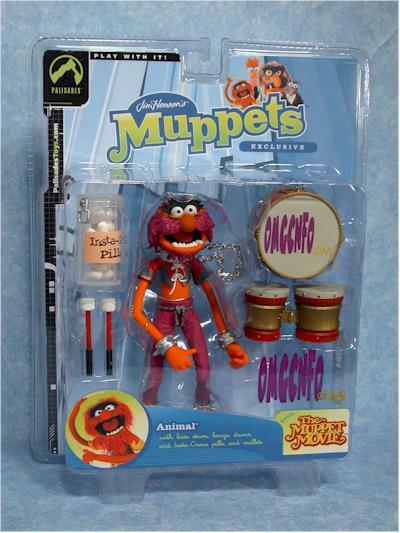 The first version was only available with the Electric Mayhem playset, while a second repainted version was the Tour Exclusive last year. 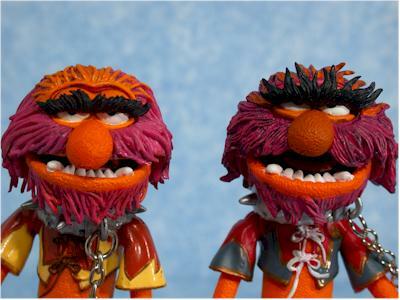 This year we get much more than a repaint, with an all new head sculpt and some additional articulation in Animal 2. But this isn't just one Animal - it's three. Three different on-line retailers picked up Animal 2, so that the overall quantity of this guy would be high enough to make it worth Palisades' while. Each retailer got to have a unique color combination, and their logo printed on the drum. The colors are different on the drum sticks, drum, shirt and pants between all three. Oh My God, Cheap New Figures On-line.com (who wins for the longest retailer name I've ever seen) got a version that's predominately red and gold. Killer Toys picked up a version that's black and silver, and Collector's Paradise went with a blue and gold appearance. All three are $14.95 right now at their respective web sites. Clamshells. I love them. Are they hard to open? Yes, but what are you, six? They also withstand shelf and shipping abuse great, cut way down on theft at the store, and allow for all kinds of cool insert graphics and designs. MOCers love them because they are easy to store and hold up great over time. I can deal with having to cut them open for the benefit of all. This is definitely not the original Animal, with a much more detailed head sculpt. The hair is finer, wilder and crazier, and the work around the eyes and eyebrows much more closely resembles the actual puppet. This is actually the head sculpt from the Mega Animal, which I felt was a distinct improvement over the original. Even shrunk down to this size, it looks great. 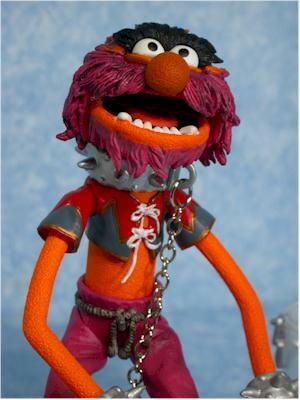 While the cuffs and collar are plastic, the chain hanging from his neck is metal. It works great with the drum, and it's so stylish! I've included a couple of photos of the original head sculpt, both open eyes and closed eyes, for you to compare. The original had much thicker hair, more like playdoh really. This is a much neater and cleaner sculpt, and comes much closer to a puppet appearance. Okay, so this is the tricky part - explaining the various color differences. First though, let me say that the overall quality on all three figures was extremely good. I saw no serious slop or over spray, and there was NO stickiness to the paint. Do be careful with the black eyebrows though - they can leave rub marks on the eyeballs. I didn't have too much trouble, but I was careful, and I've heard other folks had issues. The omgcnfo.com version is in a red/gold combo. The drum and bongos have these colors, with the logo on one side of the drum. Animal himself has rather pink pants (at least they look pink to me, but I suppose they could be red), and a red and green shirt with a white string. The cuffs and choker are all silver, like the original. The closures on the pill bottle are also silver. The drumsticks are red and white with black handles. Killer Toys has a black and silver combo. Again, the drum and bongos are done in this color, as are the drum sticks (black handles again). Animal has a black and silver shirt with black pants, and the same silver cuffs and choker as the original. The closures on the pill bottle are also silver. Finally, there's the Collector Paradise version in blue and gold. At least that's the colors of the drum and bongos, while the drum sticks are solid black with white heads. Animal's shirt is green and yellow with a blue string, with blue pants. His other big change is in the choker and cuffs, which are now gold instead of silver. The closures on the pill bottle are also gold. So which looks best? That's a very personal decision, and I have to admit that there are parts of each I like. 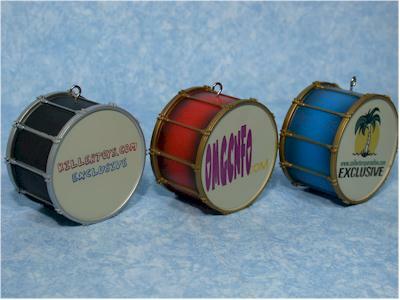 I like the red and gold colors of the drum and bongos on the omgcnfo.com version, the silver and black clothes on the Killer Toys version (which go nicely with the tuxedo figures), and the logo on the drum of Collector's Paradise. I'm glad I didn't try to pick just one! 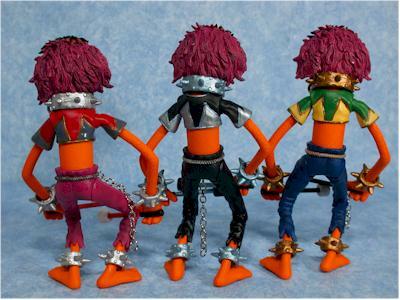 You might want to consider how these would look with the repainted band members, if you'll be displaying them together. The articulation is improved here over the original Animal. He has all the joints that the original does - ball jointed neck and shoulders, mouth, eyebrows, cut biceps, wrists, waist, hips and ankles - plus he adds one more very helpful joint...the knees! By adding the knee joints to the leg sculpt, they've really improved the posing possibilities, and made it quite a bit easier to keep this guy standing. It also helps getting the drum balanced on his chest just right if you go for that look. All the joints work well, and this figure is a great example of how valuable cut joints like those in the arms, wrists and ankles can be. The ball jointed neck has a good range of motion, and the jointed eyebrows and jaw are musts for a character like Animal. Each figure comes with quite a few accessories, particularly for an exclusive. Each has the large drum, with the logo of the on-line retailer printed on one side. There's also a hook on top that can be used to hook the drum to his neck chain. 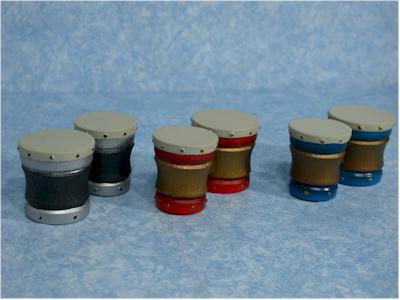 Each figure also has a set of bongos, again in a matching color combination. 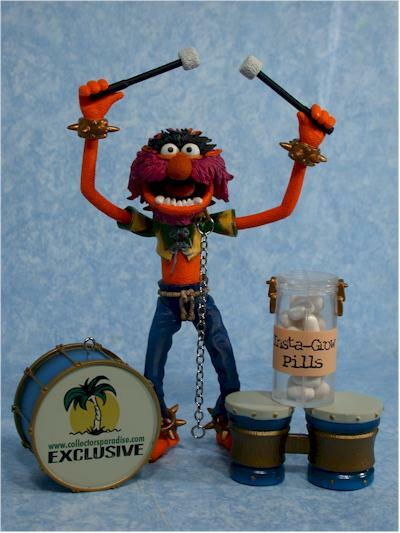 There's a jar of insta-grow pills, which does not open, and a pair of drum sticks designed for the single drum. One thing Palisades has always done well with this line is the accessories, and this is no exception. While a couple more would have been nice, it's really not necessary for the value, since these are long run exclusive figures. 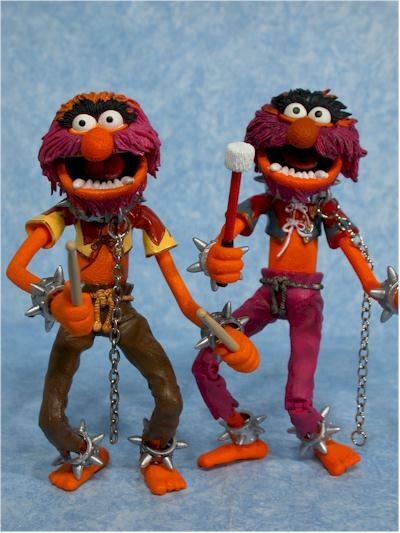 If you're kids love the Muppets, you know they love Animal. He just has that, uh, animal magnetism. With the added articulation, the great sculpt, and the nifty accessories, this figure is a lot of fun. The next (and last full series) release is due in early November, and they will run around $10 - $12 each, depending on the store. These are exclusives, yet managed to stay in the usual $15 exclusive range, even with a nice selection of accessories. For us suckers, er, completists, getting all three is a tad expensive, but for those only looking to pick up one version of Animal 2, $15 ain't bad. Animal 2 is now my favorite version of Animal, combining some great accessories with a much improved head sculpt and even improved articulation. Which one of these three is my favorite? I really can't decide. Each one has something different going for it, and picking just one isn't going to be easy. 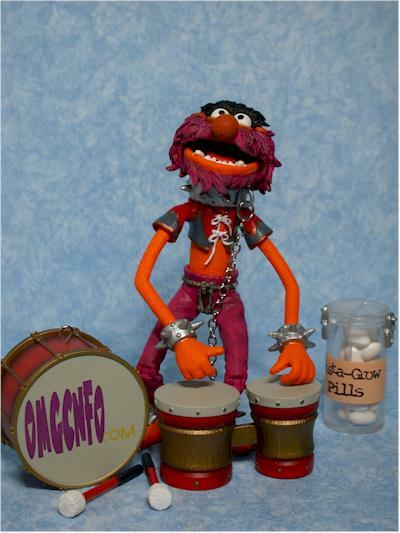 I also want to make a special mention that omgcnfo.com has a second exclusive to their store only (in the U.S.), and you don't want to miss it - it's Sweetums! 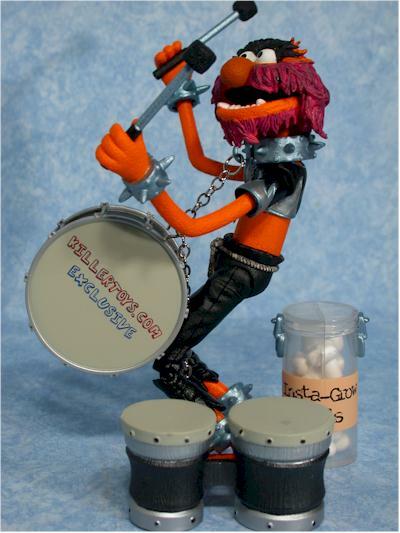 Man, I can not wait for this figure to hit, as he was one of my first favorite characters in the Muppet universe. He's huge as well, about 10" tall, so he'll tower over the rest of the Muppets. - OMGCNFO.com has the red/gold version for $14.95. 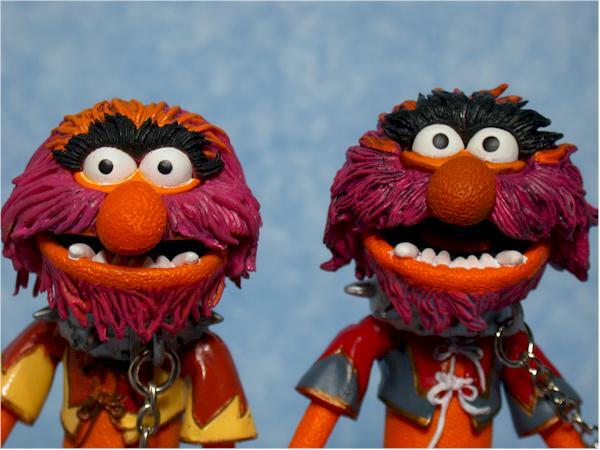 They are also taking pre-orders for Sweetums, an exclusive to their store! - Killer Toys has the black and silver version for $14.95. - Collector's Paradise has the blue and gold version for $14.95.